guy on craigslist says this rims are from a chevy GMC truck. I did not think they made them 5 lug since 1999.
his info on the rims. But if his info on the correct on the pattern they should fit. Does anybody know what vehicle they are from? Sadly, this 19" wheel does not clear GXP/Gen5 Camaro Brembo brakes, if you ever may contemplate adding them. What is a Good price on 19 inch Camaro rims with tires? $500? So I need a 20 inch rim? I'm only pointing out that the specific 19" Camaro OE wheel being discussed presents the issue, if you may have plans to go to larger brakes--nothing more than that. If you think a Brembo setup might be in your future, there are both 18 & 19 wheels that fit and clear the larger Brembo brake options....just did not want to see you get locked into a specific wheel that brings limitations, then end up having to change wheels (more cost) to accommodate a big brake setup. More often the issue is not wheel diameter, rather it's the wheel offset and back of wheel spoke profile that causes problems with the Brembo brake setups, which literally bolt-on to the PPV (from Camaro or SS sedan). 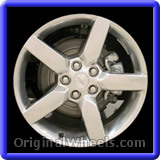 A larger diameter wheel alone will not guarantee clearance laterally, only radially. Strange the timing on this as I just finished the brembo install on my car which already had a set of these 19" camaro OEM wheels.. This info on the offset is correct, however its only on the front calipers that there is any issue and its a very minor clearance, I believe with a 1mm thick wheel spacer you could get the clearance needed to make it work. However I was going to redo the calipers anyway and decided to have a go with a grinder to see what was possible. There is a large amount of material on these calipers and again I would estimate that I removed less than 1mm from the inside edge of the caliper and just feathered it back into the body, once sanded better and repainted you won't see anything at all. It won't do any good to express disapproval for grinding on the caliper body--it's done, and it was successful, but it makes me cringe, honestly. Most spacer suppliers won't likely make a 1mm spacer, as it would not be durable, long-term, and is much more easily deformed than a thicker spacer. I just had spacers made that were 2.5mm, and my source, Motorsport Tech, only acknowldeges on it's website the availability of 3mm spacers. I called and requested the 2.5mm thickness and they agreed to do it, but implied that is the absolute minimum they would be willing to provide. While I'm still waiting for confirmation, there IS a possible Brembo scenario being researched that may allow replacement of the stock caliper with a Brembo caliper, while keeping the 345mm PPV front rotors--and clearing 19" and even 18" Camaro wheels, possibly. This is sort of "half a loaf" solution, as it really doesn't result in the same degree of performance enhancement of the larger (355mm) and thicker (32mm vs 30mm) rotors - in other words, increased rotor mass should be one of the improvement areas vs stock brakes. As you'll see below, it's a serious possibility, and unlike the PPV, for G8 GT owners still running stock brakes (321mm front rotor), changing to 345mm rotors and a Brembo caliper is a significant improvement, and allows retention of the stock wheels. very interesting find, the calipers while similar are clearly somewhat different. They don't use that external crossover tube either, which was a major PIA to me while doing the refinishing. Strange the made the rotor size smaller wonder if they would work on the 355mm ones also?